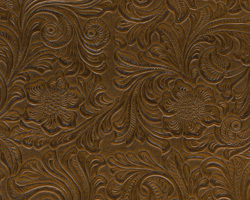 "Laramie" is a deeply embossed expanded vinyl with a tooled leather grain and supported with a strong knit backing. It is 54" wide and suitable for upholstery, wallcovering, crafts and hobbies as well as all sewn items. .